Have you ever finished a book and just sat starting into the blue beyond because the story is over? After the “blue beyond” stare you started Google-ing for any kind of information or pictures about the characters. I just read one of those books. I’m bummed it’s over. I think about my life, my character, and my place in the world often. This book is about a woman who thought about the same kind of stuff as me. The only difference is that she acted on her thoughts. She didn’t just let her thoughts swim around in her brain everyday without a single act in their honor. I can’t give you any details about her actions because family members are planning to read this book. I don’t want to give anything away. The book is about so much more than one woman. There’s Denver and Ron. I realized while reading this book, that I highly admire people who act. The do-ers. The movers and shakers. 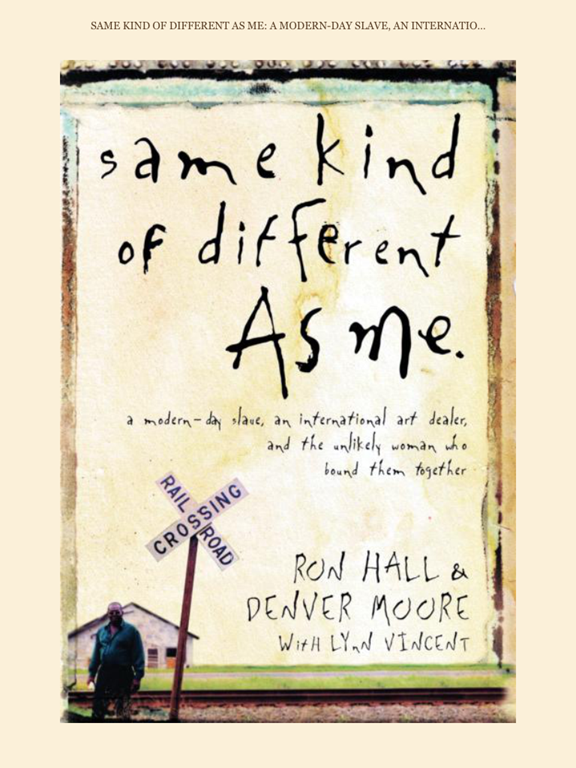 This book made me think how the world can be impacted by just one person. One person really can make a difference. Here’s something else that is so cool. I still can’t get over the awesomeness of this. I checked out this book for free from the Tulsa Library. It downloaded on my Ipad Kindle app without ever leaving my house. I love technology. A year ago, I was old school. I was checking out library books in a quiet library ran by grumpy old ladies with gray hair that looked like football helmets. I much prefer the new plan. It begins outside a burning plantation hut in Louisiana . . . and an East Texas honky-tonk . . . and, without a doubt, in the heart of God. It unfolds in a Hollywood hacienda . . . an upscale New York gallery . . . a downtown dumpster . . . a Texas ranch. Gritty with pain and betrayal and brutality, this true story also shines with an unexpected, life-changing love. I’m going to take a break from reading for a day or two. I want to let my thoughts on this book marinate for a few days in my mind. If you’re looking for something good to read with a Christian flavor, I highly recommend this book. This entry was posted in My Stuff and tagged books, reading. Bookmark the permalink.